The definition of hypertension in children and adolescents is based on blood pressure data from a large population of healthy children and adolescents from infancy to age 17 years. Such data were not available prior to the 1970s, and measurement of blood pressure was not a standard practice in asymptomatic healthy children at the time. In the absence of reference data on blood pressure levels in healthy children, adult criteria were used. Early preliminary data on blood pressure levels in healthy children indicated that the normal range of blood pressure was considerably lower than in adults, and there was a progressive increase in blood pressure levels that corresponded to childhood growth and development. Subsequently, several large observational studies were conducted on healthy children and adolescents. These studies applied uniform methods in blood pressure measurement along with growth measures of height and weight. 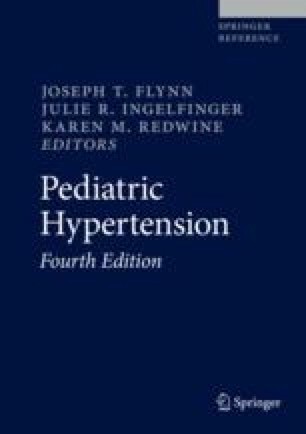 The combined data from these studies were analyzed to determine the normal childhood distribution of blood pressure levels upon which current childhood definitions of hypertension are based. In the absence of morbidity and mortality data, hypertension in childhood is defined statistically based upon the distribution of blood pressure values in otherwise healthy children.